The Battle of Britain was a continued attack by the German Air Force (Luftwaffe) on Great Britain during the Summer and Autumn of 1940. The Battle of Britain was the first major campaign to be fought only by air forces, and was also the largest and longest aerial bombing campaign to that date. On the 7th of September 1940, a massive series of raids with nearly four hundred bombers and more than six hundred fighters targeted docks on the Thames in London, day and night. ↑ 1 RCAF Squadron was not formed under Article XV because the unit was formed in Canada in 1937. When it was sent to Britain in 1940, it was manned by RCAF (including some American) officers, paid at Canadian pay rates, and its Canadian built Hurricanes were supplied by the Canadian government. In effect 1 RCAF Sqn. was a sovereign Canadian unit under the operational control of the RAF. By contrast the Polish and Czech manned squadrons were formed as RAF units and fell completely within the RAF's administrative and operational structure. ↑ Quoting Luftwaffe General Werner Kreipe: Terraine states the outcome as "decisive", Kreipe describes it as a strategic failure and turning point in the Second World War. Kreipe also states the "German Air Force was bled almost to death, and suffered losses that could never be made good throughout the course of the war". Quoting Dr Klee "The invasion and subjugation of Britain was made to depend on that battle, and its outcome therefore materially influenced the further course and fate of the war as a whole". ↑ Fighter Command's victory was decisive. Not only had it survived, it ended the battle stronger than it had ever been. On 6 July its operational strength stood at 1,259 pilots. On 2 November, the figure was 1,796, an increase of over 40%. It had also seriously mauled its assailant. In a lecture held in Berlin on 2 February 1944, the intelligence officer of KG 2, Hauptmann Otto Bechle, showed that from August to December 1940 German fighter strength declined by 30% and bomber strength by 25%. ↑ "The Battle was one of the great turning points in the Second World War—a defensive victory which saved the Island base and so, once Russia and the United States became involved, made future offensive victories possible." ↑ "As it was, the pragmatism of Dowding and his Fighter Command staff, the self-sacrifice of their pilots and the innovation of radar inflicted on Nazi Germany its first defeat. The legacy of that defeat would be long delayed in its effects; but the survival of an independent Britain which it assured was the event that most certainly determined the downfall of Hitler's Germany." ↑ "Given the ambiguous results of subsequent air campaigns against Germany. Japan, North Korea, and North Vietnam, it is probably fair to say that the Battle of Britain was the single most decisive air campaign in history." ↑ "A decisive battle has been defined as one in which a 'contrary event would have essentially varied the drama of the world in all its subsequent stages'. By this reckoning, the Battle of Britain was certainly decisive." ↑ Bungay quoting Drew Middleton in The Sky Suspended: In 1945 the Soviets asked Gerd von Rundstedt which battle of the war he considered to be most decisive. Expecting him to say "Stalingrad", he said "The Battle of Britain". The Soviets left immediately. ↑ Figures taken from Quartermaster General 6th Battalion returns on 10 August 1940. According to these, the Luftwaffe deployed 3,358 aircraft against Britain, of which 2,550 were serviceable. The force was made up by 934 single-seat fighters, 289 two-seat fighters, 1,481 medium bombers, 327 dive-bombers, 195 reconnaissance and 93 coastal aircraft, including unserviceable aircraft. The number of serviceable aircraft amounted to 805 single-seat fighters, 224 two-seat fighters, 998 medium bombers, 261 dive-bombers, 151 reconnaissance and 80 coastal aircraft. ↑ The Luftwaffe possessed 4,074 aircraft, but not all of these were deployed against Britain. The force was made up of 1,107 single-seat fighters, 357 two-seat fighters, 1,380 medium bombers, 428 dive-bombers, 569 reconnaissance and 233 coastal aircraft, including unserviceable aircraft. 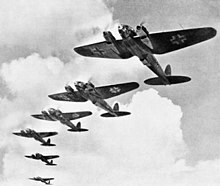 The Luftwaffe air strength given is from the Quartermaster General 6th Battalion numbers for 29 June 1940. ↑ 873 fighters and 1,014 bombers destroyed. ↑ Peszke 1980, p. 134. ↑ "World War II: The RCAF Overseas." airforce.forces.gc.ca, 3 April 2009. Retrieved: 6 February 2010. ↑ "No 1 (R.C.A.F.) Hurricane Squadron." the-battle-of-britain.co.uk. Retrieved: 6 February 2010. ↑ Terraine 1985, p. 219. ↑ Shulman 2004, p. 63. ↑ 6.0 6.1 6.2 Bungay 2000, p. 368. ↑ Hough and Richards 2007, p. xv. ↑ Overy 2001, p. 267 in Addison and Crang's The Burning Blue quotes A.J.P Taylor "a true air war, even if on a small scale and had decisive strategic results". ↑ Deighton 1980, p. 213. ↑ Keegan 1997, p. 81. ↑ Buell 2002, p. 83. ↑ Terraine 1985, p. 181. ↑ Shirer 1991, p. 769. ↑ AJP Taylor 1974, p. 67. ↑ Bungay 2000, p. 386. ↑ 16.0 16.1 Bungay 2000, p. 107. ↑ Wood and Dempster 2003, p. 318. ↑ Ramsay 1989, pp. 251–297. ↑ Wood and Dempster 2003, p. 309. ↑ In practice, Northern Ireland and Scotland were out of reach by virue of their greater distance from airfields in Europe. ↑ "Battle of Britain 1940." battleofbritain.net. Retrieved: 28 June 2010. ↑ "Audio Clip of Churchill's speech." bbc.co.uk. Retrieved: 28 June 2010. ↑ Putland, Alan L. "7 September 1940." Battle of Britain Historical Society. Retrieved:12 August 2009. ↑ Putland, Alan L. "7 September 1940 - The Aftermath." Battle of Britain Historical Society. Retrieved: 12 August 2009. ↑ Putland, Alan L. "8 September - 9 September 1940." Battle of Britain Historical Society. Retrieved: 12 August 2009. ↑ 31.0 31.1 Green, Ron and Mark Harrison. "Forgotten frontline exhibition tells how Luftwaffe fought with soldiers on Kent marshes." KentOnline, 30 September 2009. Retrieved: 21 August 2010. ↑ "RADAR means: Radio Detection and Ranging." NASA, 14 October 20017. Retrieved: 12 September 2010. ↑ Ramsay, Winston, ed. 1989. The Battle of Britain then and now: Mk V. London: Battle of Britain Prints International Ltd. ISBN 0-900913-46-0. ↑ Holmes, Tony. 2007. Spitfire vs Bf 109: Battle of Britain. Osprey, London. ISBN 978-1-84603-190-8. This page was last changed on 11 August 2018, at 20:29.